An exercise program’s ultimate goal should be about being healthy, while connecting the mind and body as part of your lifestyle. Your body image should be the byproduct of a balanced exercise program. But it’s hard to stay in shape if every exercise routine falls by the wayside within weeks and every fitness goal is forgotten until the next New Year’s resolutions are made. Follow my top 5 tips to designing a fitness routine that works for your individual needs, and you will have an easier time sticking to it. Focusing on taking care of your body will result in a great body—along with an empty space on that list of resolutions when New Year’s rolls around. What do you want to accomplish with your fitness program? Make a list of goals or changes you would like to make in your lifestyle. Some good examples are weight loss, increased strength, increased energy, stress reduction, preventive healthcare, and increased metabolism. Realistic, achievable goals will keep you motivated, focused, and interested as you watch those goals become reality. How much time can you realistically give toward exercise and fitness each day or each week? 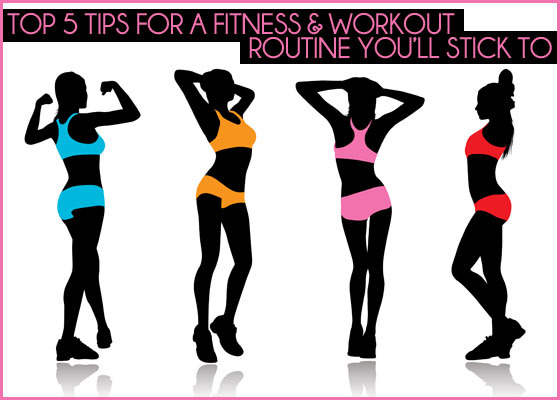 Try to set regular times for your workouts and develop a consistent routine. Remember, we all make choices every day about what we schedule into our lives. Exercise is a commitment. Focus your workouts and exercise choices around activities you enjoy, while taking into account previous injuries and family medical history. Try to make exercise fun and interesting. Exercise should be an integral part of a balanced lifestyle. Your workout program should combine strength training exercises, cardiovascular cross-training, flexibility activities, and mind-centering practices. You should change the flow of your workout regularly for continued progress and to avoid boredom. This way, you promote a mind-and-body connection. Your body will tell you when to push harder and when to back off while working out. Stay connected to how you are feeling. If your body is tired, don’t force yourself to do a hard workout. Alter your workout to be more relaxing by doing more flexibility work, which is meditative; otherwise you will only succeed in fatiguing your body further. On the flip side, if you are mentally tired, do activities that will rejuvenate you, such as cardiovascular training and strength training. Either way, exercise on a daily basis. You will feel better about yourself and your life as a whole. Does the idea of exercise and diet stress you out? Read some of our latest health & fitness articles. • Stress Relief through Meditation: How Do I Begin? • Eat Like a Kid: Guilt-Free Comfort Food Recipes!